The Wisconsin Department of Natural Resources has approved the diversion of 7 million gallons of water a day to be used primarily for the proposed Foxconn plant. Critics question whether the diversion complies with the Great Lakes Compact, which restricts use of Lake Michigan water outside of the lake’s basin. The Taiwanese company Foxconn, which was lured to Wisconsin with a $3.2 billion state incentives package, is in need of water for its production of LCD panels. And now, the plant will have it — barring a challenge from environmental groups. 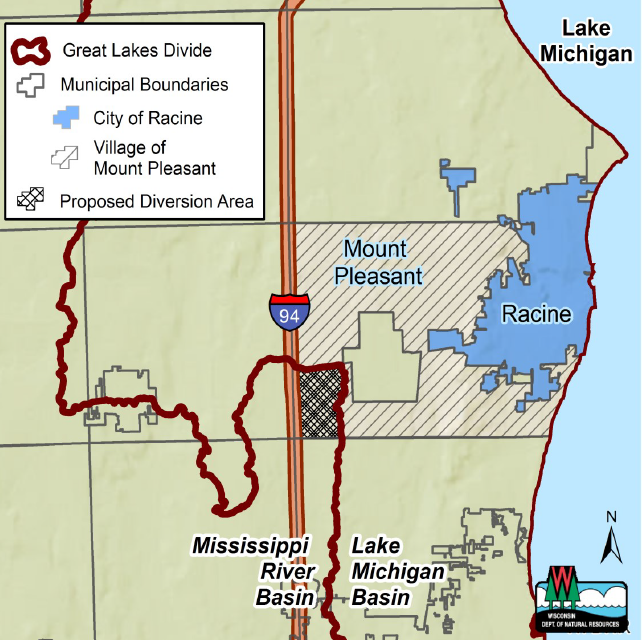 The Department of Natural Resources on April 25 approved a request from the city of Racine’s water utility — which serves the village of Mount Pleasant, where the Foxconn facility will soon be constructed — to divert 7 million gallons of water per day from Lake Michigan, most of it for Foxconn’s $10 billion campus. How will Lake Michigan water be used? Racine’s diversion application included a budget of where the 7 million gallons per day of water from Lake Michigan will go. The diversion would make up 12 percent of Racine’s existing withdrawal capacity, according to the diversion application. Racine is currently allowed to withdraw up to 60 million gallons per day from Lake Michigan. In 2016, the Racine Water Utility used an average of 16.9 million gallons per day, serving 30,425 residential customers, 2,308 commercial customers and 302 industrial customers. 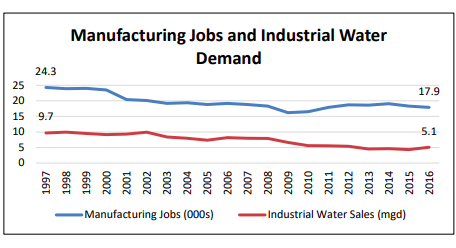 City of Racine Great Lakes Diversion Application / Ruekert & Mielke, Inc.
Industrial water sales by the Racine water system have dropped by nearly half over the past 20 years as manufacturing jobs have left the service area. The city says the additional 7 million gallons a day in Lake Michigan water to help supply Foxconn would not be far from its historical use patterns and would not exceed its current allotment. The city argues that the diversion for Foxconn would fall within its historical consumption of water for industrial uses. According to the application, between 1997 and 2016, industrial water sales in Racine fell by 47 percent to 5.1 million gallons a day as manufacturing jobs have left the area. The application says that of the 7 million gallon diversion, 5.8 million gallons would go to Foxconn. Three million gallons per day would be used in the manufacturing process, 2.4 million gallons would be used for cooling, with the remainder for domestic uses such as toilets and handwashing. Of that total 5.8 million gallons, 2.5 million would be consumed, or not returned to the lake, and 3.3 million gallons would be treated and returned to the lake. The remaining 1.2 million gallons of the 7 million gallon a day diversion would be used for other “commercial and industrial purposes,” according to the application. None of the water being diverted to Mount Pleasant is earmarked for residential use. “We’re reviewing the DNR’s decision and weighing our options in coordination with our coalition partners,” said Ezra Meyer, water resources specialist with environmental group Clean Wisconsin. “This proposed diversion does not meet the letter or spirit of the Great Lakes Compact. Racine’s application is clear in stating that none of the diverted water from Lake Michigan would be used for public purposes, as required by the Compact and state law,” Meyer said in a statement. The 2008 Great Lakes Compact is an agreement that bans new diversions of water leaving the Great Lakes Basin, or the land that drains water into the Great Lakes, except under “strictly regulated” circumstances. One of those circumstances is that a diversion can be approved is if the request will serve “public water supply purposes.” Wisconsin state law defines a public water supply as one which serves “largely residential customers,” but may also serve some industrial or commercial customers. A potential issue that arises from the diversion is Mount Pleasant’s status as a “straddling community,” or one that sits within two watersheds. Mount Pleasant sits partially within the Great Lakes Basin and partially within the Mississippi River Basin, connected by the Kilbourn Ditch. That is an agricultural canal running through the Foxconn property that connects to the Des Plaines River in the Mississippi watershed. As part of its incentive package, Foxconn was exempted from having to create an environmental impact statement for the project, limiting what can be understood about its impact. The company was also exempted from complying with certain state wetlands restrictions. An environmental impact statement would have disclosed potential changes in the environment that the construction of and industrial activities at the Foxconn plant would create. One day after the water diversion was approved, the DNR OK’d Foxconn’s air emissions permits, a first step towards allowing the company to emit pollutants, including volatile organic compounds and greenhouse gases, into the air, according to the DNR. On May 4, the Illinois attorney general announced plans to sue the U.S. Environmental Protection Agency over its decision to exempt the part of Racine County where Foxconn will be built from being named a nonattainment area for ozone. That designation would have required the plant to further reduce emissions. Foxconn also has received criticism for its treatment of the environment in China. According to several news sources that cited 2013 reporting by the Wall Street Journal, Foxconn was investigated for allegedly dumping heavy metals into a river. In another incident, after employees voiced concerns about poor ventilation in their Chengdu, China plant, combustible dusts caused an explosion in 2011 that killed three people and injured 15.